Laying in my stifling tent, my dirty laundry bag sufficing as a pillow, I’m hoping to catch a breeze. Thinking of the last couple of days, I try to capture the memories before they blend together. It seems that beautiful landscapes, tough rides, coke stops and a constant feeling of tiredness are repetitive aspects of each day. I would normally also say insatiable hunger, but the heat seems to retard that need that is normally associated with lengthy bike tours. We left Arusha, Tanzania, after my mini-break with Mary and we were instantly thrown back into the fire. The first two days totaled just over 200 miles in the saddle and about 10,000′ of climbing. That was eighteen hours for an old man like myself. 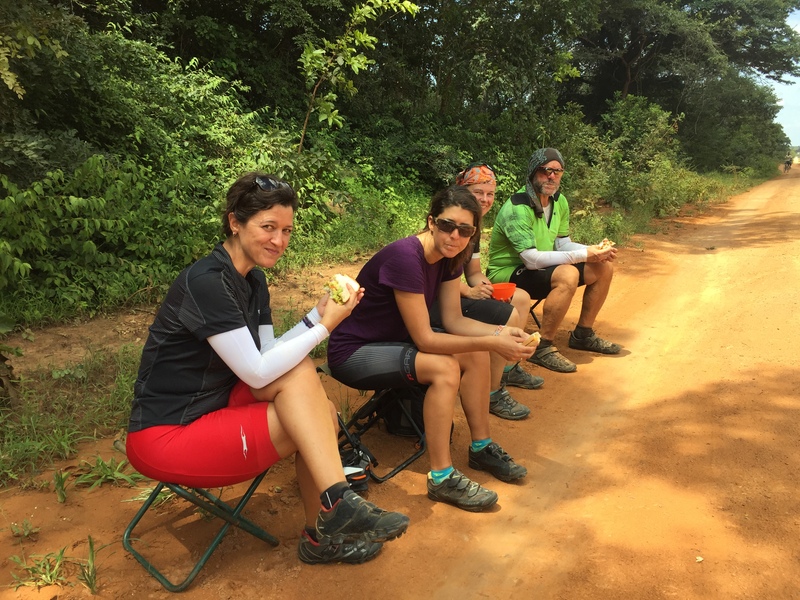 We had numerous refreshment stops and extended lunches, so that helped in conserving energy, but it’s still a long time in the scorching sun. The third day was a meager 85 miles (138 km), but the last 18 miles was off-road. We were lucky the roads had dried from the previous day’s torrential downpour. My riding partner, Mike “Crash Hopper,” Carter and I had a strong finish considering the potholes, rocks and sand. We were inspired by a few locals, that rode their single speeds along side and laughed and joked as we raced along. It was then time to venture off-road for three and a half days and finish out the week with one of the most demanding climbing days of the tour. The fourth and fifth days were difficult, but rain free, so everyone was smiling and still in good spirits. Along the route we saw giraffes, baboons, and an assorted number of other wildlife, (we missed the hippos). The sixth day was a different story. Like an amateur, I didn’t check my tires until after breakfast and surprise, surprise….. two flat tires. So with a little help with my friends, Crash and Bear (Brian Cebryk, a new joiner), we changed tubes and set out for that day’s adventure. Only 35 km out, the dinner truck was stuck in the mud. A miserable situation and we decided to help dig them out. We ended up being more like supervisors, as a number of locals showed up with hoes and shovels. It was a desperate situation and we were not making a lot of progress. Luckily a local farmer showed up and pulled us out with his tractor. We were at the dig for more than a couple of hours. It was an unanimous decision by myself and my two riding partners to jump in the truck and make our way to camp. It was that, or arriving about 6:00 pm. Too late for dinner and get organized for the next big riding day. The seventh day was a grueling day of ascending 2,140 m or 7,095′ over a 109 km, (67 miles). Climbing galore, with a little rain thrown in. The first 40 km was a very technical off-road climb and decent and then we finished on pavement, endlessly climbing into the skies. Tough, tough day, but a ride I enjoyed immensely. In the end, we road 578 miles, (932 km), for this seven day stretch and ascended 8,439 m (27,848′). Camped out every night, without facilities…I’m ready for our rest day in Mbeya. An interesting bug-bit is that besides biting my backside a few times a day, the tsetse flies have shown a liking for my beard. Certainly a distraction on the downhills. For you sports enthusiasts, after dinner, a couple of nights, we did muster enough energy for a fun game of cricket. I have no idea what the rules are, but figured out that when in the field, if you catch it, it’s a good thing and then when you’re at bat, you can hit it in any direction. 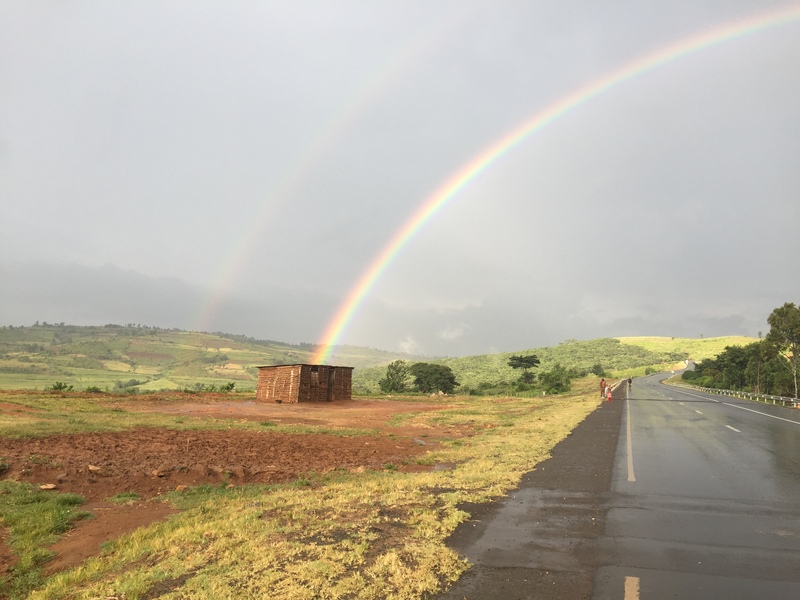 We have now traversed 4,070 miles, (6,565 km) and will be entering our sixth county when we enter Malawi in two days. 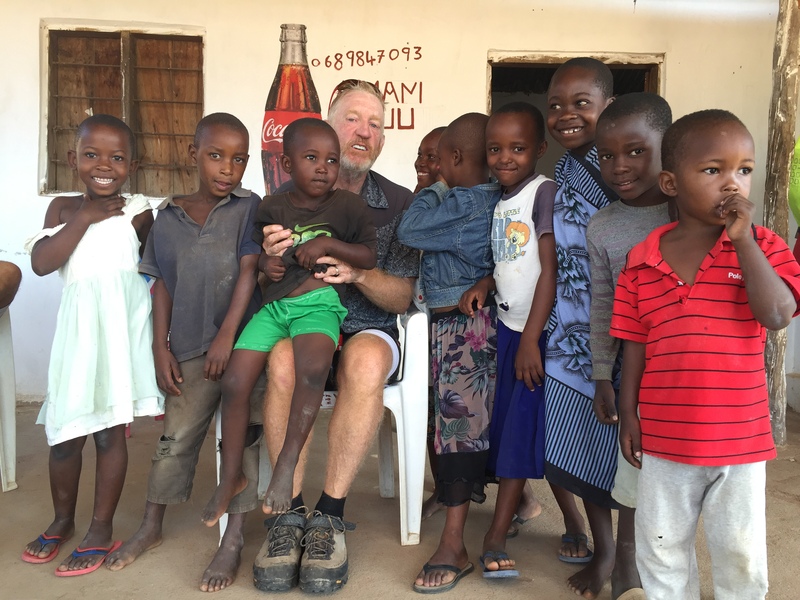 The people, including the kids, in both Kenya and Tanzania have been great. Lots of smiles, waves and warm welcomes throughout these East African countries. There’s no doubt, these people make the best out of life with the sparse gifts that have been bestowed upon them. I’m loving life and so grateful for this once in a lifetime opportunity. 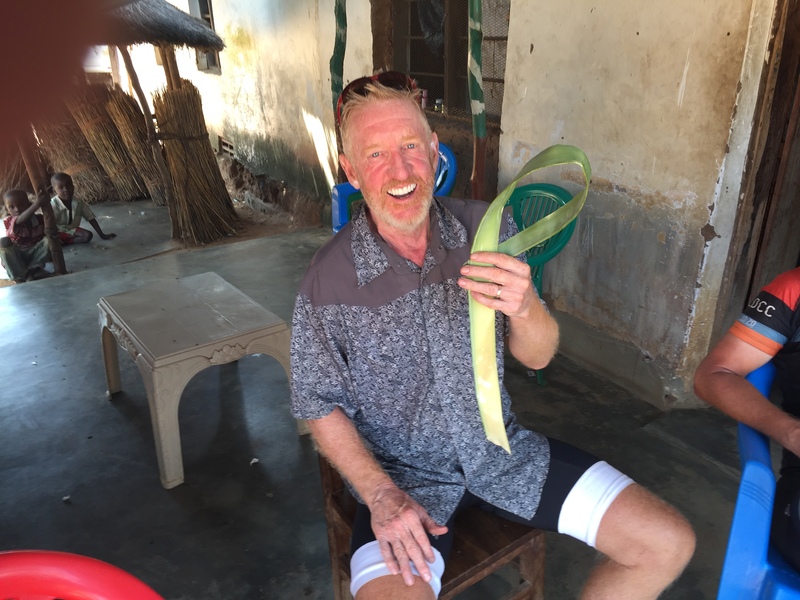 This happened a couple of weeks ago, but I have to share with you an unusual lunch experience, not typical, but always plausible on the TDA tour. It was a ride of 130 km, so the lunch truck set things up around the 70 km mark. Not really a tough day, but a headwind added a little stress. There were four of us riding together and we hit the lunch truck after about three hours of riding. Not a world record pace, but considering we made a Coke stop earlier, we were making good progress. We pulled off the road and down a small dirt path about 10 meters to where the truck was located. Catlin, the mechanic and part time lunch chef, had prepared tuna fish, fruit and the usual peanut butter, Nutella and other accruements. He announced, as we entered his domain, “watch out for the bees.” He wasn’t kidding, thousands of bees all over everything. You’d think we’d stolen the queen bee. Despite this unpleasantry, we had to eat. When you’re riding thousand of miles, one thing you don’t skip is a meal. So we made our sandwiches, picked at the fruit and pretended that it was lunch as usual, with hundreds of bees all over our cloths and food. Next it was a hump of camels that lumbered their way into our temporary resting place. They kicked up the sand with no regard. After the dust settled, a Shepard led his huge flock of sheep right into the eating area. They bee-lined it, excuse the pun, right towards the hand wash station and a small puddle of dirty water. They knocked over chairs, the water jug and split around Brenda Trenholme who was stuck in the middle of the chaos. So, now we have a large number of stinky sheep crashing our exclusive lunch party and thousands of African killer bees swarming. A little too much excitement for this brief break. Oh well, and that too shall pass. We finished eating in haste and jumped back on our bikes. Off we went. Just another lunch on the road with the TDA. Mary arrived in Nairobi, for a visit on March 10th, our 37th wedding anniversary. She and Katja’s husband Pierre, from South Africa, where waiting at the roadside, as our convoy finished up the days ride. It was a nightmare affair, riding into Nairobi, as the traffic was indifferent to our presence and the diesel fumes choked everyone into submission. At camp, we said our good byes to my fellow riders and scurried off to a outstanding hotel, near the Nairobi airport, called the Ole Sereni. The next day were flew to Eldoret and were greeted by Juli McGowan and her husband Titus at the airport. Juli is the amazing founder and director of The Living Room, the organization that operates the Kimbilio Hospice, (“Kimbilio” means “refuge” in Swahili). We were greeted at the hospice by a large group of workers, locals and visitors that sang a heart warming and moving Swahili welcoming song. There was one primary gentleman that sang the verses and everyone joined in on the chorus. We sang and danced our way around greeting everyone and then the entourage finished up at a tree planting ceremony. The avocado tree was to commemorate our visit and the many donors that are supporting the hospice encouraged by my cycling journey. The ceremony and reception brought Mary and I both to tears. We toured the facility and then enjoyed the wonderful hospitality of Juli, Titus, Allison, David and their families. The commitment and love these people have for their fellow man is evident in everything they do. Truly doing God’s work. The next day, we lounged around and shared breakfast and lunch with our most gracious hosts. Then Titus drove us to Eldoret to visit the new site that will be the home for the “Eldoret Care Center.” The property just exuded peace and tranquility and will be a wonderful location for their new 60 bed hospice, a funeral home, a health and education center and a welcoming facility. Juli and her team need to raise $2,000,000 to complete this multi phase project. We hope that many of you find the goodness in your heart to support this collaborative enterprise. Mary and I then made our way to the Maasai Mara for three nights of fun and relaxation. Our first ever safari will be a blast. I’ll be back in the saddle March 17th, as I join back up with my cycling group in Arusha, Tanzania. There’ll be two months remaining and about 6,000 km, before we make it to our destination of Cape Town, South Africa. Day 40 of our tour was a day of fun and games. Douwe Cunningham devised a scavenger hunt for everyone to emphasize interaction with the locals and give everyone a day of easy riding. It was a 74 Km day and we made up 5 teams of four. Our team, the Chieftains, was composed of Stef, Douwe, Mike “Crash” Carter, Craig T and myself. Our first task was a “creative picture with a local,” so we coerced a sheep herder into grabbing one of his sheep and allowing us to dress it in one of our riding jerseys. It was no easy undertaking, but certainly a blast. Then we flagged down a huge flat bed truck to “use a local mode of transport,” and had him drive all of us up a big climb. The highlight of the day was when we stopped at a school, unannounced and talked the headmaster into allowing us to exchanged songs with the entire school body. There must have been 200 kids, eager, yet confused as to what these weird “Muzungas, (white foreigners)”, were doing at their school. We sang “Old McDonald had a Farm,” and had a few laughs, but likely just added to the oddity of the situation. Steph, who has spent time in Kenya working, sang with the kids and really loosened them up. They then reciprocated and sang us a couple Kenyan tunes. It was a moving experience to see and hear all these enthusiastic youngsters. We finished the hunt by “having a beer with a local.” One beer led to a couple and we rolled into camp all saying it was the best day of riding the entire trip. The rest day in Masabit was marvelous. “Rest ” is the operative word. As mentioned, we stayed in a monastery, run by the Nazareth Sisters of the Enunciation. The campsite was grassy, with a few huge cows grazing the grounds. The rooms, which I chose to enjoy, were clean and private. Showers with hot water were most welcomed. The day started with mass at 7:00 am, which Mike Voisin and I attended. We both agreed that the Sisters sang like angels. Breakfast followed and then some easy stretching to help with the aches and pains. Craig Thompson and I then started the walk into town, but shortly after wandering down a dusty road with a few scattered huts, a pick-up truck stopped and offered us a ride. I hung on for dear life, as we rode in the back and took the bumpy, windy road. 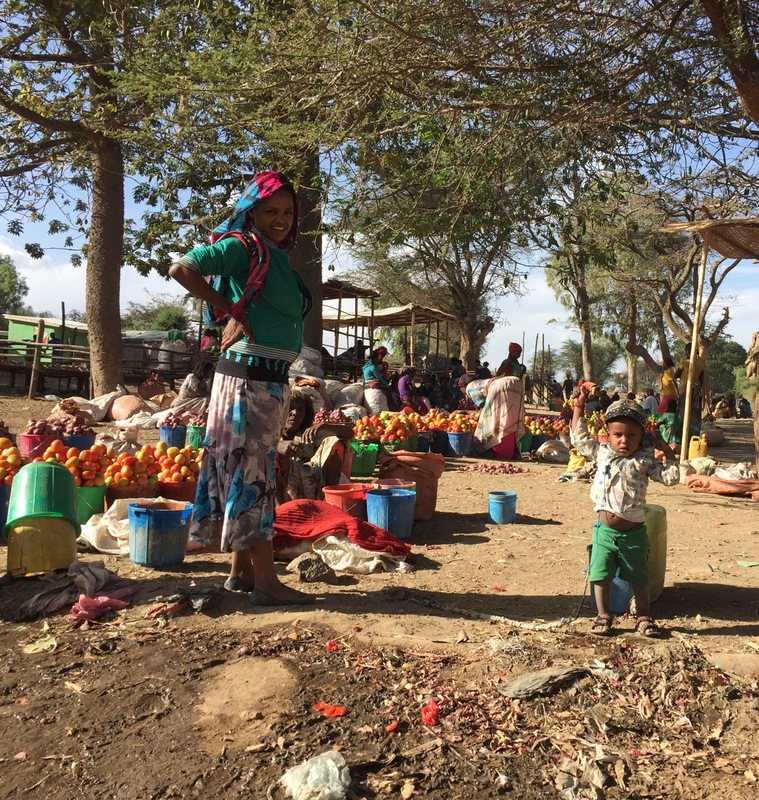 Only a couple of kilometers from the monastery, Marsabit is just a few dirt roads with broken down storefronts and the odd cafe. After a trip to the bank, my next order of business was a haircut and beard trimming. ( I have to look good when Mary arrives next week in Nairobi). A great experience, as the local barber, meticulously cut, trimmed and topped it off with a shampoo and hot towel treatment. What a pleasure. A quick stop at a grocery store and a bite to eat, rounded out the morning. I was left with the rest of the afternoon to clean my bike, read and lounge around. One happy guy. Then it was back on the road for four more days of riding and one bus day. The bus day was to avoid an area where they had troubles a few years ago. The riding was quite easy, as one day we had a scavenger hunt, during our 75 km route. (More on that in the next blog). The people in this part of Kenya are still very tribal. It was amazing to see a young guy walking down the street in sandals, with a blanket over his shoulder, a man’s skirt, while carrying a spear, or some other primitive weapon. The women had the most beautiful beads and colorful dress. Today we crossed the equator in a town called Nanyuki. We all stopped for photos at the sign indicating we had crossed into the Southern Hemisphere. The ride into Nairobi was a nightmare. About 5,000′ of climbing over the 70 mile ride, but the real challenge was the traffic and roads. Trucks, trucks and more trucks, all spewing enough diesel fumes to choke a horse. Cars passing trucks on two lane roads and forcing us off the road numerous times. Then it was a major highway into the congested city. Chaos to put it lightly. In any case, everyone arrived safely and overjoyed to be have almost now competed 45% of the journey. Mary arrived yesterday and was at the camp to meet me when our convoy finished. Tonight we enjoyed an anniversary dinner at the hotel. Tomorrow we will fly to Eldoret to visit Julie and her team at Kimbilio Hospice. Then it’s off on safari for a few days of luxury. I’m really looking forward to the break. I’ll meet back up with the TDA group in Arusha, after missing only two days of riding, but it will be 6 days and comfort and relaxation with my wonderful bride. We have now travelled 5,388 Km or 3,340 miles. That’s about the same distance as LA to NYC. 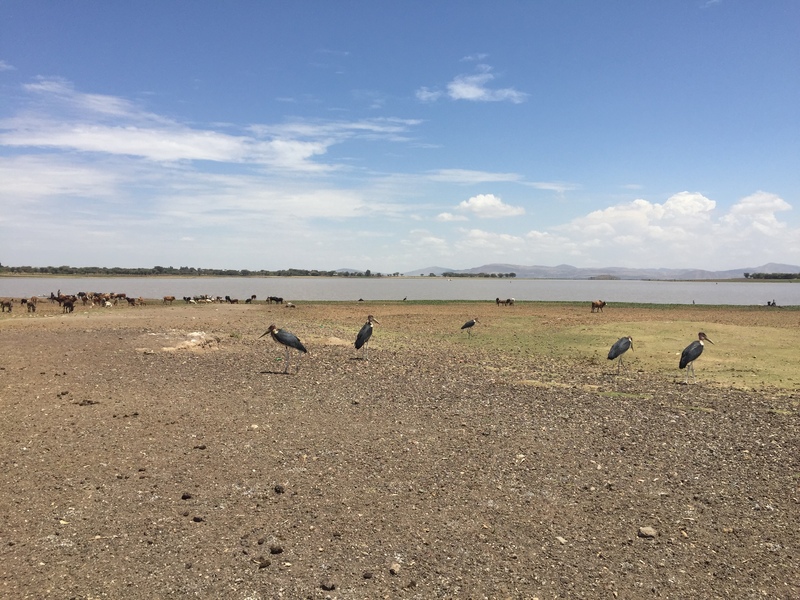 It’s difficult to keep up my blog because an Internet connection is difficult to find in the parts of Ethiopia and Kenya we’ve been the last couple of weeks. In any case, today we are in north-east Kenya, in a town called Marsabit, for a rest day. 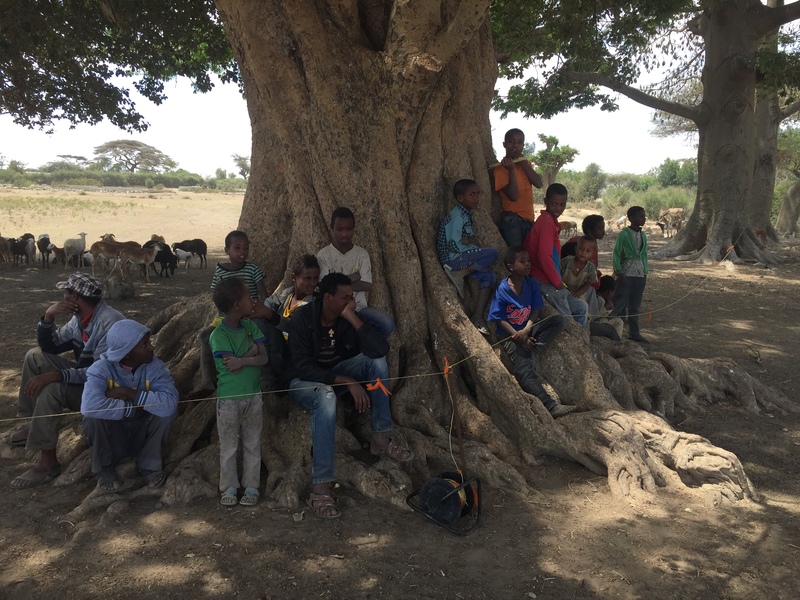 Our last rest day was in Yabello, Ethiopia. Yabello, supposedly a spot famous for bird watchers is a pit. The Yabello Hotel, where everyone either camped, or took a room was a dump and managed by a bunch of money grubbing rip-off artists. For instance, when we arrived a number of us had a couple of beers and later found out they were charging us twice the published price. I decided to go to a hotel a couple of doors down and paid $15/ night, a significant savings from the $50 they were charging at the Yabello Hotel. Both hotels were disgusting, but I felt good about not supporting the criminals down the road. In the town of Yabello the electricity is only on a couple of hours each day. So you can imagine the problems that causes. No hot showers, no power to cook meals and no cold drinks are just a few of the conveniences you and I take for granted, that are not available in this dismal East African town. The riding the past eight days has been tough to brutal. For the first 3 days, plus a bus day, there was a lot of construction, so the roads were dusty, gravel and bumpy. When a truck passed it created a bowl of blinding dust that caused you to close your eyes and hope for the best. The next four days were on good roads for most of the time, except for a short, difficult stretch, of construction again. The problem for two of these days, or about 260 Km, was a relentless headwind that brought everyone to their knees. Oh ya, did I tell you it was over 100 degrees Fahrenheit most of the day. As mentioned, I arrived in one piece to Marsabit and will enjoy a rest day here at a monastery run by the Nazareth Sisters of the Enunciation. Looks like it will be a peaceful stop and I might even catch mass in the morning. And for those of you worried about my safety, we have three arm guards traveling with us for this stretch. We don’t have to worry about stone throwing kids, just the bad guys that sneak over this way from Somalia. A couple of interesting animal / insect happenings, at this weeks campsites, were three scorpions were found in tents. Also, one guy had his fly chewed up by the hyenas, as he left it off his tent and strewn off to the side. I’m sure that won’t be the end of my animal / insect stories as this continent is wild.